Proteinuria means there is an abnormal amount of protein in the urine (wee). Normally there is very little protein that is lost in the urine. Many children with proteinuria have no symptoms. Although all children who have proteinuria need tests, in many it goes away without treatment. In a few children, the proteinuria is a sign of a problem with the kidneys, and they may need special treatment. Some children lose a lot of protein, which can cause the body to swell – this is called nephrotic syndrome. any long-term effects of proteinuria. 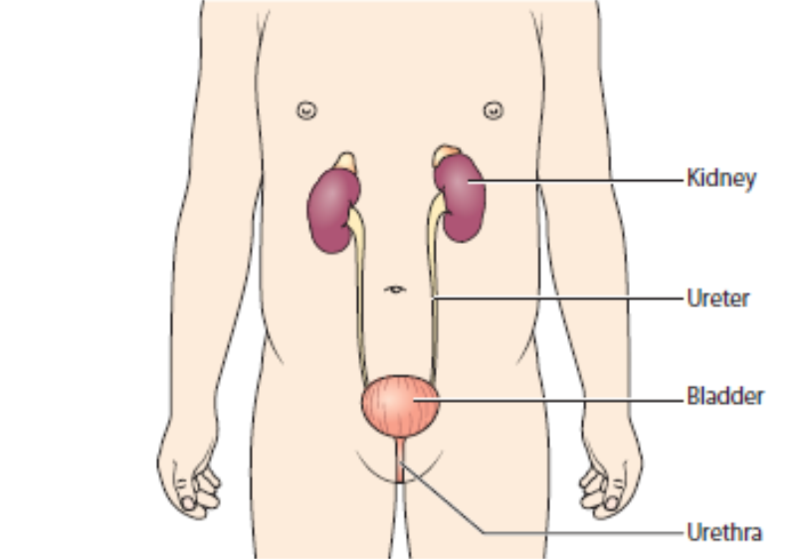 The urinary system is made up of two kidneys, two ureters, a bladder and a urethra. The urinary system gets rid of things that the body no longer needs so that we can grow and stay healthy. The bladder is a muscular bag that stores urine until we are ready to urinate (wee). It sits low down in the pelvis. The urethra is a tube that carries urine from the bladder to the outside of the body. We urinate (wee) through the opening. Proteinuria means there is more protein than normal in the urine. It happens when the kidneys leak protein into the urine. Protein is an important part of our diet and is in most foods. There are different types of proteins in the blood. The most common type is called albumin. Often, only albumin is found in the urine – this is called albuminuria. If there is only a very small amount of albumin in the urine, this is called microalbuminuria. Doctors have found proteinuria in about 2 or 3 out of 100 children of any age. In most children this is mild proteinuria that is harmless. Almost 1 in 100 children have persistent proteinuria, which means that it continues over time. This may be more serious. Most children with proteinuria do not have any symptoms. You cannot usually see protein in the urine, but occasionally the urine looks frothy. When the kidneys leak a lot of protein this is called nephrotic range proteinuria. This causes nephrotic syndrome. Children often have swelling in their body, especially their face, legs and feet. Haematuria means there is blood in the urine - if there is a lot, the urine may be red or dark brown. This is occasionally seen with proteinuria. Some children have protein in their urine only at certain times of the day, after exercise, or during a fever or a urinary tract infection when germs get into the urine and travel up the urinary system. In these cases, it is not serious. with high blood pressure (hypertension). Your child’s doctor can diagnose (identify) proteinuria with a urine test. Proteinuria may be found during a urine test for another reason – for example, if your doctor thinks your child has another condition or during a routine health check. Your doctor will also speak with you and your child about his or her symptoms and examine your child. If the first test shows there is protein in your child’s urine, he or she will need more tests to help find out whether the proteinuria is serious. Your child may need further tests, such as blood tests. Many children will not need treatment. Some children will need to be monitored or treated, and may need to take medicines to reduce the amount of protein lost in their urine or control their blood pressure. For many children, proteinuria is mild and will go away in a few weeks without any treatment. In a few children, proteinuria is a sign of kidney damage – for example, scars or inflammation. Often this damage is minor and their kidneys work normally. They may need to go back to hospital or clinic for occasional follow-up appointments. 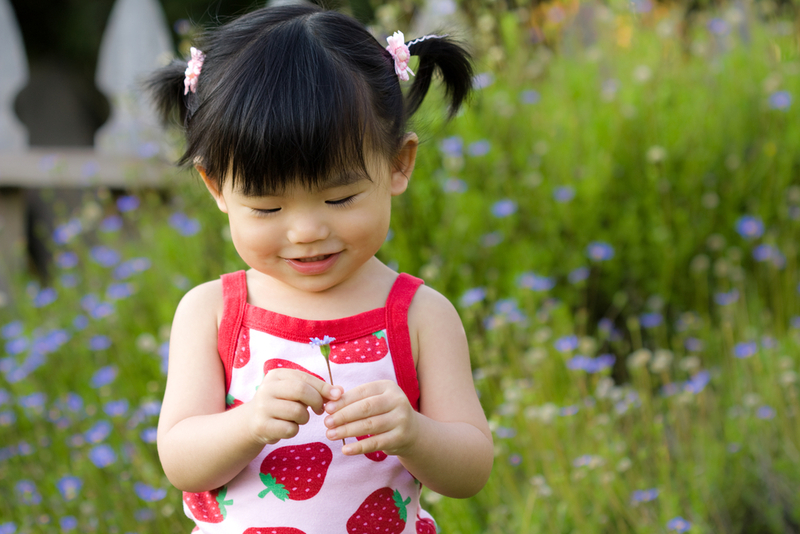 A very small number of children will have long-term problems with their kidneys. These children may need further care. They will need to go back to the hospital or clinic for regular follow-up appointments. Your doctor will try to find out why your child has proteinuria, though this is not always possible. Proteinuria may be mild or last for a short time, or it may be more severe or last for a long time. The kidneys have many tiny filters (glomeruli). They normally help remove extra water and waste, which are passed out in urine, and make sure the body keeps what it needs, including protein. In proteinuria, the glomeruli become more leaky than usual. Protein is an important part of our diet and is in most foods. When we eat protein, it is digested (broken down) in the stomach and intestines and taken into the blood. Proteinuria may be mild if it happens during the daytime with only small amounts of protein leaked, or it lasts for a short time during a fever or urinary tract infection. Sometimes the kidneys leak a small amount of protein during the daytime, especially when standing up and after exercise. This is called orthostatic proteinuria (‘orthostatic’ refers to standing up) or postural proteinuria. In these cases the proteinuria is harmless. The kidneys may also leak some protein during a fever or a urinary tract infection (UTI), when germs get into the urine and travel up the urinary system. The proteinuria usually disappears after the child gets better, and does not cause any long-term problems. Most proteins are too big to pass through the glomeruli, and stay in the bloodstream. In proteinuria, the glomeruli become more leaky than usual. More proteins than usual pass through the glomeruli, and leave the body in urine. Some small proteins do get through healthy glomeruli and pass into the renal tubule. Most of these are re-absorbed into the bloodstream. If the tubules are damaged, they may be unable to remove the proteins back into the bloodstream. The proteins are then lost into urine. A small number of children have large amounts of protein in their urine, or have persistent proteinuria (that does not go away). These may be signs of damage in the kidneys. Nephrotic syndrome happens when a lot of protein is leaked into the urine. This means that there is less protein in the blood. This amount of proteinuria is called nephroticrange proteinuria. Children with nephrotic syndrome have swelling around their eyes or their legs or feet. Many children with this condition get better after taking medicine for a few weeks, but a few need special treatment. This type of proteinuria is very rare. It is seen in 1 or 2 children in every 100,000. Some children are born with vesicoureteral reflux (VUR). In VUR, some urine refluxes (goes back up) towards the kidneys. This makes it easier for germs that cause UTI to travel all the way up to the kidneys, where they cause a more serious infection and illness. An infection in the kidney is called pyelonephritis. When this happens, the kidneys can get scars and leak protein. Some children who have reflux also have renal dysplasia. One or both kidneys did not develop normally while they were growing in the womb. The affected kidney may leak protein. diseases that affect the renal tubules (the kidney’s tubes that carry the liquid that will become urine) – these are very rare, and include Dent disease, Lowe syndrome, Fanconi syndrome and aminoaciduria. Hypertension is blood pressure that is too high. Occasionally, this can be linked to proteinuria. There is more albumin than any other type of protein in our blood. Most of the time, the protein that is lost in the urine in proteinuria is albumin. This is because albumin is smaller than other proteins. 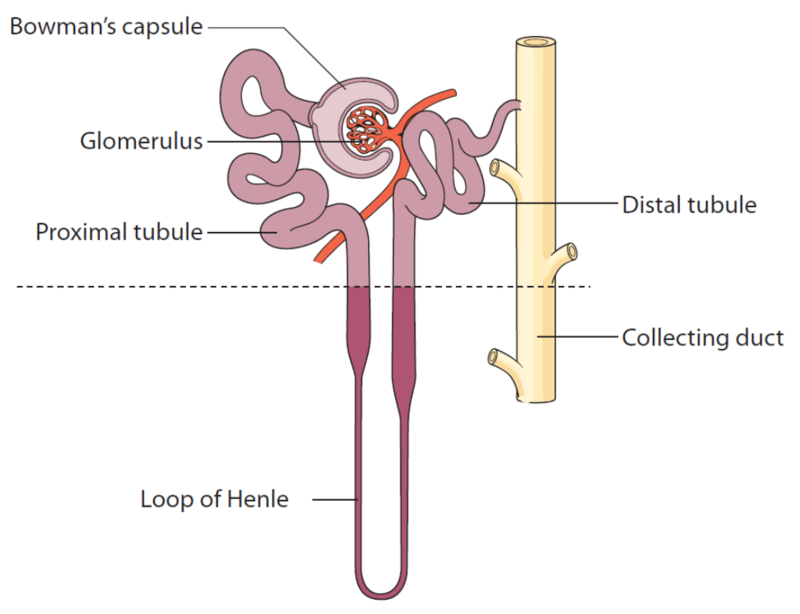 If a glomerulus (kidney filter) is only slightly damaged, it can let albumin pass through. Globulin is another type of protein. This protein is larger than albumin. If a glomerulus is more seriously damaged, it can let globulins pass through. acute kidney injury – the kidneys suddenly stop working. acute interstitial nephritis – inflammation of the kidneys, sometimes caused by the use of some medicines. Glomerulonephritis is a group of conditions that cause inflammation in the glomeruli. Children with this condition have blood and protein in their urine, and usually have swelling in their body, especially around their face and legs. Some children need special treatment. Acute kidney injury means that the kidneys stop working as well as they should – this happens over a short period of time. Many children get better after a few weeks without treatment, but others need to take medicines or have more intensive treatment. Vasculitis happens when the blood vessels in different parts of the body become inflamed – this can sometimes affect the blood vessels in the kidneys. Children who have diabetes are not able to convert (change) sugar into energy in the way they should. This can sometimes cause problems in their kidneys – called diabetic nephropathy – although this is rare in children. It usually happens after years of living with diabetes, and is more likely if the diabetes is not well controlled. Your child’s doctor can diagnose (identify) proteinuria with a urine test. Because proteinuria may not have symptoms, it is often found with urine tests done for other reasons. Your child may need other tests. Your doctor may talk to you or your child about his or her symptoms and any medicines that he or she takes, and examine your child. Your doctor or nurse will check your child’s blood pressure to find out whether it is in a healthy range. You, or a nurse, will need to collect some of your child’s urine in a small, clean container for a urine test. A dipstick will be dipped into the urine – this is a strip with chemical pads that change colour depending on what substances are in the urine. This shows whether there is protein in the urine. If the first urine test shows protein in your child’s urine, your doctor may arrange for more urine tests. Many children have a little protein in their urine occasionally – testing the urine again will confirm whether your child continues to have protein in their urine. You will need to collect samples of your child’s first morning urine, the urine passed when they first wake up in the morning. The samples may also be sent to a laboratory for more accurate tests, such as measuring the amount of protein. You may need to test your child’s urine at home to find out whether the proteinuria is still present. You will need to collect a sample of your child’s urine each morning, and test it with a dipstick. Your doctor or nurse will give you some equipment and show you what to do. A small number of children need their urine collected over a whole day and night. This can give a more accurate measurement of how much protein is being leaked. Because proteinuria can happen with urinary tract infections, your child’s urine may need to be tested to find out whether there is an infection. The test is called a urine culture. The dipstick urine test will show if there is any protein in the urine, but it does not give an accurate measurement. The following tests are done in a laboratory. The urine protein:creatinine ratio (PCR) compares the amounts of protein and creatinine in the urine. Creatinine is made all the time by muscles and normally removed by the kidneys in urine. The albumin:creatinine ratio (ACR) compares the amounts of albumin and creatinine in the urine. Nephrotic range proteinuria is defined as PCR more than 200 mg/mmol. This means that a lot of protein is leaked into the urine, and so there is less protein in the blood. A blood test can check whether there are any antibodies – the body’s immune system makes these special proteins to identify and kill specific germs. This gives information about whether there has been an infection, and sometimes which germ caused it. Urea and creatinine are chemicals that are made in the body. They are waste products and are normally removed by the kidneys into urine. In severe proteinuria, these may build up in the blood. Children with proteinuria lose protein in their urine. Some children lose a lot of protein, which means there is less protein in their blood. Albumin is one type of protein in the blood – because it is small, albumin is more likely to leak through the glomeruli. Your child may need further tests to confirm that he or she has proteinuria, what is causing it, and whether he or she has another health condition. These tests will help decide whether your child needs any treatment. In blood tests, a small amount of blood may be taken from a vein, with a needle and syringe. Special gel or cream can be used to help your child stop feeling any pain. the amount of protein in the blood – because the kidneys leak protein into urine in proteinuria, this is sometimes enough to affect how much protein is in the blood. Some children need imaging tests. These use special scanners that get images (pictures) of the inside of their body. An ultrasound scan looks at the shape and size of kidneys and other parts of the urinary system. A small handheld device is moved around your child’s skin and uses sound waves to create an image on a screen. Some children need a kidney biopsy. A tiny sample of a kidney is removed from the body with a needle. This is examined under a microscopes. special medicines are used so your child will not feel any pain or can sleep through the procedure. It can take a few weeks to get the results. Your child may be referred to a paediatrician, a children’s doctor usually based in a hospital, or a paediatric nephrologist, a doctor who treats children with kidney problems. This may happen if your child has persistent proteinuria (that does not go away), or a high level of proteinuria. After your child’s doctor has confirmed the diagnosis and the type of proteinuria, they will decide on the best treatment plan for your child. mild proteinuria that goes away after the first urine test – this may happen during a fever or a urinary tract infection. kidney damage if it is suspected. Angiotensin-converting enzyme (ACE) inhibitors and angiotensin receptor blockers (ARBs) may be used to reduce the amount of protein lost in the urine. They may also be used to help reduce or control blood pressure. Common ACE inhibitors are: captopril, enalapril, lisinopril. Doctors understand that in some children these medicines will reduce the risk of long-term kidney problems. Some children with proteinuria also have high blood pressure, or hypertension. Their blood pressure will need to be controlled so it is in the healthy range. Your healthcare team will speak with you and your family about any long-term effects your child might have with proteinuria. In most children, proteinuria is mild. Your child may need to have follow-up appointments at the hospital or clinic, especially if he or she has persistent proteinuria. It is important to go to these appointments, even if your child seems well – remember to bring the results from home urine testing. You will also have the opportunity to ask any questions. It is important that your child keeps all their appointments for these tests, to help prevent long-term damage to their kidneys. You may need to continue to do urine tests at home to check whether the proteinuria has come back. If there is proteinuria for a few days, contact your doctor. In most children, proteinuria is only present for a short time. It is harmless and will not cause problems in the long term. In a small number of children the proteinuria is a sign that there may be kidney damage – for example, scars or inflammation in the kidney. Often this damage is minor and the kidneys are working normally. A very small number of children will have long-term problems with their kidneys. Their kidneys stop working as well as they should – this happens slowly, often over many years. This is called chronic kidney disease (CKD). If your child has CKD, you and your family will learn more over time about how to help manage the condition, and what to expect. Children who have proteinuria can usually do the things that other children their age do. Often no treatment is required and they should be able to continue going to school or nursery. They can play with other children and stay active. Some child children may need to change their diet and take one or more medicines. This can be a stressful time for your child and the whole family, including other children. If your child’s proteinuria is due to a more serious kidney problem, your doctor or nurse will give you more information. This is the end of the information on proteinuria. If you would like to read more about other conditions affecting the kidneys, tests and diagnosis, treatment or supporting information, you can find a list of topics covered on the infoKID website at www.infoKID.org.uk.